You must make reservations at least 5 minutes in advance of the time at Nellie's Restaurant. Nellie’s Puerto Rican Restaurant is a family owned eatery nested in the heart of Chicago’s vibrant Puerto Rican community. Since opening in March 2006, Nellie’s has become recognized as one of “Chicago’s Best”. 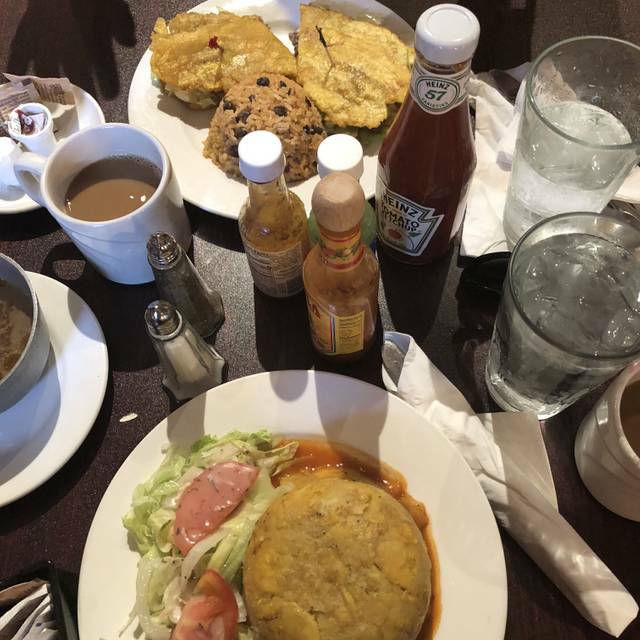 Serving a unique blend of traditional Puerto Rican cuisine and American breakfast favorites. Including their famous 'avena de coco' (coconut oatmeal) and the ever popular weekend buffet. Nellie's prepares every dish with the highest quality ingredients by a talented cooking staff and served with a warm smile. Nellie’s is not a restaurant; it is an experience. Find out what the excitement is all about! The food is delicious, the restaurant is clean and very welcoming. Service was great and the food was phenomenal. I definitely recommend the oatmeal and jibaritos. We will keep coming back! Food is great especially the guy cooking the omlets he is awesome something different buffet is excellent only issue is parking finally a puerto rican buffet. My friend and I both got the Nellie's breakfast special - we loved the oatmeal but found the omelette to be pretty bland, unfortunately. Was VERY busy and we had to wait about 15 minutes for our table, even with a reservation. BYOB is the greatest!! This restaurant just had a great ambience and great food! Great idea the owners had. Will be back soon! Wonderful atmosphere. Authentic food. Owner is always present. His passion is felt and tasted in the food served! Exceptional service! Eating at Nellie’s is like eating at your grandmother’s house. It’s great, authentic, flavorful, Puerto Rican food. The staff and service never disappoints. Had a great time at this restaurant in the heart of Humboldt Park! Good food- good service! Great food great service! Me and my family went for breakfast and we’re never disappointed. Must go! Went after a friday night bender for saturday morning brunch. The Nellie's special was really delicious, wouldn't expect plaintians to be so good in eggs. The coconut oatmeal was creamy and delicious and not overly sweet. All different types of people eating at this cozy spot, families, and older biker couple, etc, etc. Loved it, we'll be back. Love, love, love this place! Honestly can't get enough of their oatmeal!! Their weekend brunch is amazing - make sure to stop at their made-to-order omelets station! From Florida but everytime I come to Chicago Nellies is a must! Family friendly place. 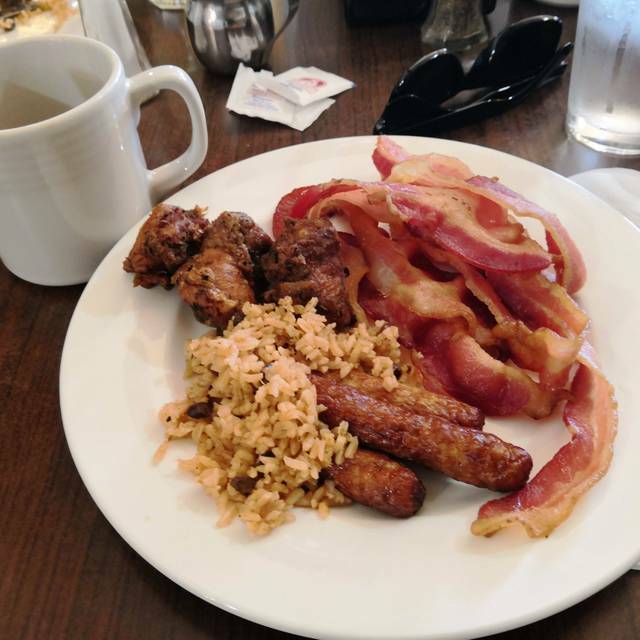 A fantastic brunch buffet that has the regular staples plus some delicious Puerto Rican specialties--arroz, platanos, etc., and a delicious coconut oatmeal! Attentive, friendly service and a great neighborhood vibe. Tge food was amazing, service was great. My family and I really enjoy the atmosphere. Great weekend brunch buffet at a great price. Definitely coming back often. I had a reservation and still had to wait half hour to get seated. Food is always on point. Service is great from all the guys. Must try the coconut oatmeal. It is amazing. I tried the Nellie's special which comes with it. So yummy. Absolutely no complaints about this place!! And I love how firm they are about their reservations!! If you have a reservation you are seated immediately!! I live in Berkeley and the restaurant is worth the 30 min drive!! Not to mention it's BYOB!! The food is amazing, the value is there but the service needs some help during busy times. Brought some new friends who are recent transplants from California to experience the greatness that is Nellie’s. Never disappoints - can’t wait to try the guava pastellito that I brought home for later! Nellie's has the best Puerto Rican brunch in Chicago. The food is delicious and authentic. You will not be disappointed! I went with my family, a party of 12 and had such a great time! The food was authentic and tasty, service was fantastic. We'll definitely be back. Very good brunch buffet complete with the best flan I have ever had. I tried a Puerto Rican lasagna with plantains rather than noodles, which was new to me. The buffet also included fresh fruit, coconut oatmeal, Puerto Rican rice and beans, pancakes, French toast, breakfast potatoes, sausage, bacon, toast, chicken, OJ, coffee, and a made to order omelet station. The servers were very nice, along with the chef. Only issue was our plates were never cleared even after we got a second round of food with new plates, so we dined with dirty plates on the table the rest of the meal. Our assigned server was busy with a larger group, and as a result we were often attended to by other staff members who we summoned instead. I do not understand the positive reviews for this place. The food is barely okay -- we had a la carte breakfast items, not the buffet, and not the traditional Puerto Rican fare. The service is ridiculously slow (we waited almost an hour for eggs and pancakes). The patio space is okay, but the inside is dark, cramped, and not particularly clean. The restroom is a nightmare. This city has many good/great brunch options, but Nellie's is not one of them. Very comfortable place serving tasty and well-prepared food from a broad menu at very reasonable prices. I love this place! As a Puerto Rican born and raised in Humboldt Park, it’s always nice to have high quality authentic Puerto Rican food. 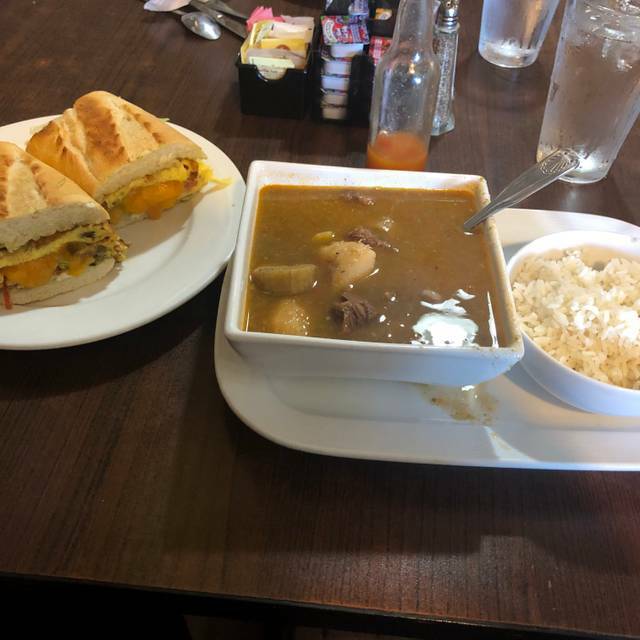 The jibarito sandwiches and shrimp monfogo are by absolute favorite dishes and I highly recommend them. You are guaranteed to be full from whatever you order! It took a good 20 minutes just to have our waiter take our order and get ONE cup of coffee because I reminded a different server that we were waiting on our coffee. It took 45 minutes just to get 3 jibarito orders out. We never saw our waiter unless we called for him. Everyone was grabbing from the buffet, so I guess we missed the memo and just ordered something off the menu. When I called the waiter to ask where our food was, he came out 5 minutes later with the food and I asked if there was a reason it took so long and he explained that they take care of the orders as they come in. I looked around and was perplexed since there were barely any customers in the restaurant that had ordered off the menu. No apologies or anything. The plantain for the jibarito was soggy. Nothing special but it was the homemade feel. The rice was good and not greasy. Overall, the food was good, but definitely not worth the wait. I’d also like to mention that there were 8 other waiters just standing around the counter NOT DOING ANYTHING. You couldn’t flag any of them down because they were just fixated on the register or talking to one another. Excellent, True Puerto Rican Food!!! I love the relaxed atmosphere. Its like going to eat at your favorite aunt's after church. The coffee is strong and good. Best thing is the charming gentleman that operates the omelet station- very polite and engaging as well as efficient. Its the kind of place you go to when you miss home. The food at Nellie’s is outstanding! Best Puertorican brunch in Chicago. I always feel like I am back at my grandma’s house. The service is great and it’s a kid friendly place. Brunch buffet was okay food looked like it was there for hours, PR lasagna was cold and salty, sausage links looked burnt, bacon wasn't fully cooked, potatoes could have been seasoned, coconut oatmeal was okay could have had some coconut bites to it, rice needed to be more moist, fried pork was kinda cold, maduros were okay some were still raw inside, french toast and pancakes should be done as ordered not in advance they were dry. The ONLY thing I liked was the omelettes and flan unlimited OJ & cafe serviced at your table. Table I sat down on was tilted and didn't fix, where the buffet was at was dark could use more lighting. Our group of 10 enjoyed weekend brunch this past Sunday: Avena de Coco (Coconut Oatmeal) was tasty & hearty start, then terrific buffet stations with fresh & hot Pastelón de Huevo (Puerto Rican style lasagna! ), Salchichas (sausages) & bacon, potato wedges, sweet plantains, pancakes, etc. The made-to-order omelettes were great. We reserved tables in advance because of size of our group, and Nellie's was ready for us with great service. Very reasonably priced! As always, Nellie's is delicious and full of friendly service. They are so sweet to my daughter. I always look forward to coming here.